Moschari Noua takes its name from the Greek word “Moschari”, which is veal and “Noix de Veau” which is the top rump, also known as silverside in many other countries. Noua as we call it in short, is a pot roast beef or veal using the above cut. It can be cooked in a pressure cooker, in a pot or Dutch oven. I don’t know the origin of the recipe but it has a French name, so it could be French or it could be English because Cyprus, where I was born, was a British colony. This recipe was given to me by a friend of mine when I was single. At that time we did not ask much about the recipes. If we liked what we ate we just wrote down the ingredients and method of cooking. I have named it a Cypriot but it is not a traditional Cypriot recipe. I always serve it with mashed potatoes and mixed vegetables and top it with a very flavourful gravy made with the juices of the meet. In my pressure cooker there is a steam basket for steaming vegetables and I steam mine in there. If you don’t have one, steam them or boil them the usual way. To make the gravy I make a roux and then add the leftover juices exuded from the cooked meat and some milk. The colour of the sauce becomes lighter if you add less juices and more milk. Slit the meat in two places and put the cinnamon stick and the garlic and season with salt and pepper,. Heat the olive oil in the pressure cooker and sauté meat on all sides. Add the wine, wait for some seconds for alcohol to evaporate and then add the water. Add the vegetables on top and close the pressure cooker. When the bulb turns, reduce heat and cook for 30 minutes. When cooked, remove the cinnamon stick and the garlic and let it cool well before cutting it into thin slices. In a small pot heat the olive oil or butter and saute the mushrooms. Add the flour and brown to make a roux. Add the leftover juices mixing with a wooden spoon or whisk, to dissolve any lumps, and then add the milk and mix until the gravy thickens. Taste and season accordingly. Serve with mashed potatoes or pumpkin potato puree, vegetables and gravy. Moschari Noua takes its name from the Greek word "Moschari", which is veal and "Noix de Veau" which is the top rump, also known as silverside in many other countries. 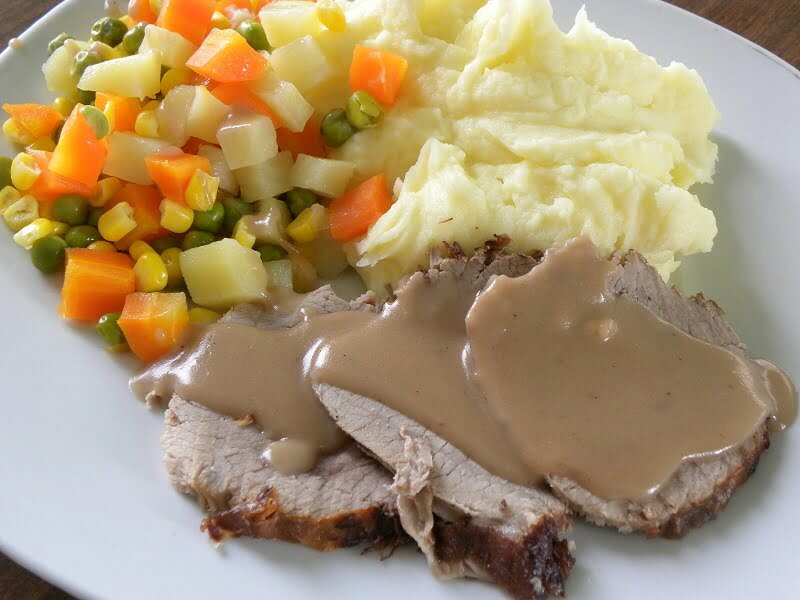 Noua as we call it in short, is a pot roast beef or veal using the above cut. It can be cooked in a pressure cooker, in a pot or Dutch oven.